General consensus: In United Polaris business Cabin, 1D and 6D/E are the best seats on this plane due to the giant footrest area and direct aisle access without anyone having to step over you to get to the aisle. 1E is very close to the forward lav, however. The 2R lav is forward of the galley and nowhere near 6E. 6E seat is angled to the right. Pax barely needs to turn head to right and he’s looking into the lav door. That's absolutely wrong. The lav is on the far side of the galley and then across 2R. It is physically impossible to see it from 6E. People keep confusing 1E with 6E. They are completely different seats. Which you can tell pretty easily just from looking at the seat map. Ditto.Unless someone has X ray vision, extremely long neck (like elastic girl) or other super hero abilities, there is no way one can see the lavatory from 6E. Is there room to stand up directly in front of seats 29 DEF — the lone E+ row directly behind the galley — or is there overhead storage there? I haven't been able to find a forward-facing photo of that area of the plane. Thanks. There's overhead bins there, as there are throughout the plane, but like in all the center section seats you can stand up (unless you're very tall, in which case that problem will confront you in all the seats.) 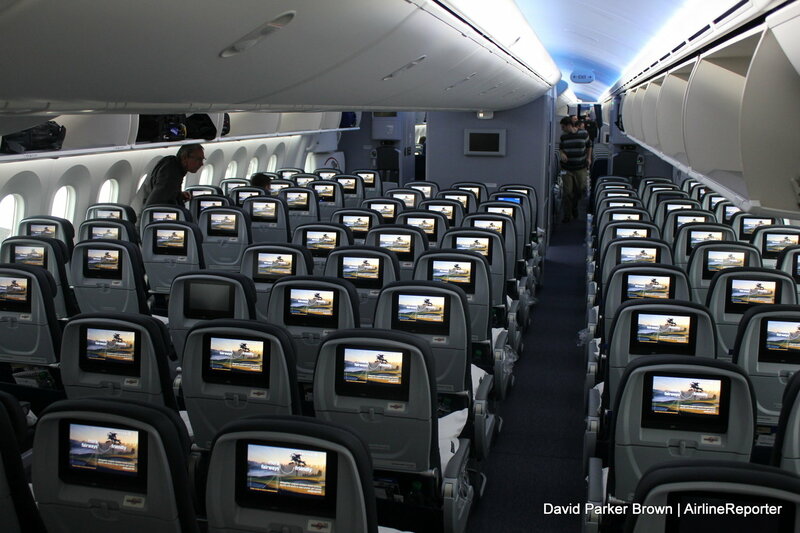 This pic is from the back of the plane, showing the second of the two economy cabins. Thanks. I've seen the warnings about people congregating in front of the Row 27 seats; I wasn't sure if 29DEF was also such an area (and/or a place where people cut across from one side of the plane to the other). Unless you are very close friends, there's not enough room for additional people to stand when 29DEF are occupied. Same goes for any other bulkhead seat. Flying LAX-PVG in a few weeks with a buddy in business. I'm assuming the flight is daylight almost all 13 hours. Do you ever feel claustrophobic in the middle seats, not being near a window? 6D&E are open, so thinking about grabbing them. Is it any easier to talk in the middle vs. window pairs? flown 1 D/E and 6 D/E on quite a few 14+ hour flights on the 789 (mainly SYD-HOU-SYD and MEL-LAX-MEL). I'm assuming the flight is daylight almost all 13 hours. And you won't know it anyway, because the FAs will see to it that the windows are darkened after the dinner service ends (if not before). Hi. Any idea why 27L would be ASA restricted? I tried to choose it for a May flight but it would not go through. I called and the agent told me it was ASA. Thanks! ASA? Do you mean ADA? I think it is Advanced Seat assignment. I found this thread so assume that is what the acronym means: What does "Advance seat assignments are restricted for this flight" mean?